Fairbourne Railway01341 250362work Steam RailwayThe Fairbourne Railway extends two miles between Fairbourne Village and Barmouth Ferry where it connects with a ferry which takes passengers across the Afon Mawddach to Barmouth. Four Steam Engines operate passenger services along the 12 ¼ inch gauge track. Return tickets are valid all day and passengers may break their journey at any of the four request stops. The full round trip takes 60 mins and all trains are normally steam hauled. 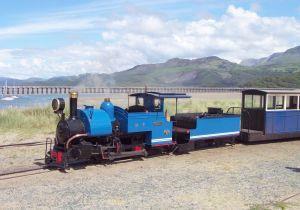 The Fairbourne Railway extends two miles between Fairbourne Village and Barmouth Ferry where it connects with a ferry which takes passengers across the Afon Mawddach to Barmouth. Four Steam Engines operate passenger services along the 12 ¼ inch gauge track. 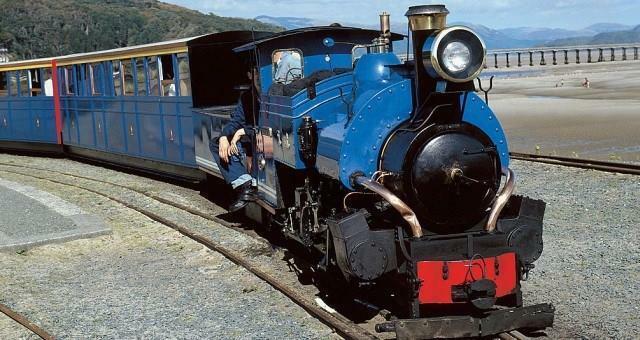 The Fairbourne Railway track was originally laid in 1895 by Mr. Arthur McDougall, of flour fame, to transport building materials for the construction of Fairbourne Village. Since then his horse drawn trams have been replaced by steam engines and in 1985 the 15 inch gauge track was converted to 12 ¼ inch. Also "Diesel on Demand" Service: 1 - 3, 8 - 10, 15 - 17 & 22 - 24 October. See website for train times. 2019 Prices Adult £10.50; Children (3 - 15) £1.00 Accompanied, £6.00 Unaccompanied, Under 3 Free (except on Santa Specials).